Woven or non-woven fibrous materials like paper, cardboards and textiles are used in countless occasions in our everyday life. To name few they are utilized as writing or printing matter, packaging and containers, cloths and accessories, fabrics for interior and exterior design, constructions, etc. Fibrous materials can be obtained from natural fibers of plant or animal origin, as cellulose, silk or wool, or from synthetic fibers, obtained from petroleum, as nylon, polyesters or acrylics. The vast majority of the fibers of both categories suffer the effects of their hygroscopic nature since water or humidity absorption can lead to undesired effects varying from fiber to fiber, like appearance alteration, yellowing, loss of mechanical properties, fungal growth. Most of the fibrous materials can also be easily stained from oily substances and are unable to withstand big mechanical loads even in the cases they are designed for applications like packaging and constructions. The possibility to overcome these drawbacks can lead to prolonged or repeatable use and optimization of the performances of the fibrous materials, paving the way to a wiser and optimized consumption of the natural resources of these materials. Scientists of the Smart Materials Group of the Istituto Italiano di Tecnologia (IIT) have developed and optimized a technology that can be applied to practically any fibrous material and tackles all the above mentioned problematics of the fibrous substrates. After the treatment every single fiber gets covered and protected by an ultrathin polymeric nanocomposite layer, whereas the porous nature of the substrates is preserved. This macroscopically is translated into materials that appear and feel unaltered upon contact. 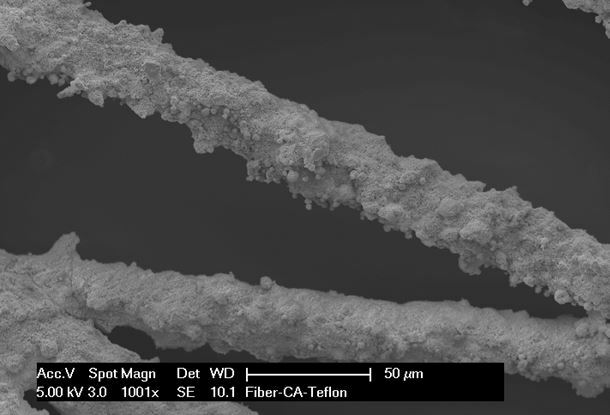 The application of the nanocomposite treatment of the fibers is done by impregnating each fiber of the medium separately with a polymeric nanocomposite solution, using methods, as spray, rod coating, or dip coating. After the treatment, the fibrous substrates become repellent to water, humidity, oily substances and can increase their mechanical resistance. For each type of fibrous substrate a different kind of polymeric nanocoating is used that reassures some chemical interaction between them, making the treatment stable in time. Incorporating different nano or microfillers in the polymeric shell of the fibers, the treated fibrous substrates can attain different properties related to the intrinsic characteristics of the introduced fillers. To name few possibilities, incorporation of silver, iron oxide, quantum dots, wax nano or microparticles can turn the fibrous substrates into antibacterial, magnetic, fluorescent or superhydrophobic, respectively. A combination of functional fillers in the fibers’ nanocomposite shells can therefore lead to multifunctional fibrous materials. This technology can be advantageous for the Food Packaging field, where the use of natural cellulose-based packages can be optimized, also in the case that the packages originate from recycled paper. Indeed, the developed treatment can be used on different kinds of cellulosic containers in order to avoid the migration of toxic substances like mineral oils from recycled paper to food or to avoid water and oil leakage from the food to the food containers. On the top the mechanical resistance of the food containers can be improved. All the polymers used for this scope are FDA approved. Another category of porous materials that have been functionalized by the Smart Materials Group of IIT using nanotechnology are polymeric foams. In particular, polymeric nanocomposite foams have been developed using a combination of nanoparticle solutions and polymers of desired properties, in order to be used mainly for cleaning marine and aquatic ecosystems from oil, petrol, dyes, or heavy metal ion contaminants. Oil and fuel spills released during industrial accidents or oil tankers and ships sinking, toxic chemicals and heavy metals released to rivers and sea by industrial sites are some of the unfortunately many catastrophic events for the waters of our planet. To avoid such environmental disasters, immediate polluted water purification and long-term water preservation are essential, and the nanocomposite foams developed at IIT can provide a solution. In many cases already existing foams appropriately modified can be used, but foams can also be fabricated using simple template, gas, or chemical techniques. The technology developed for water-oil separation uses magnetoactive superhydrophobic and superoleophilic foams. In particular, polyurethane foams are rendered superhydrophobic and simultaneously oil absorbing, and can be used for the purification of oil contaminants from water. The polyurethane foams are loaded with colloidal superparamagnetic iron oxide nanoparticles throughout their volume (internal pores) and are covered only onto their surfaces with Teflon submicrometer particles. The treated foams totally repel the water and can absorb more than 13 times their weight in oil so they can efficiently separate oil from water. 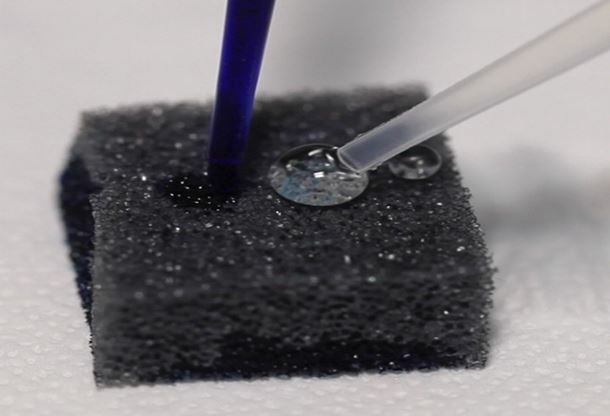 In addition to the water-repellent and oil absorbing capabilities, the functionalized foams exhibit also magnetic responsivity, so they can be moved to the oil spill with magnets by a certain distance. Another technology that can be exploited for selective pollutant entrapment deals with the exclusive functionalization with nanoparticles of the pores’ surface of the foams. For this reason flexible elastometric foams with tunable pore sizes have been developed by an IIT patented technology. In particular, spherical microbeads of calcium alginate produced by microfluidic drop generators are incorporated closely packed into the elastomer material during its cross linking. After the solidification of the elastomer the calcium alginate microbeads are removed by a simple procedure (sacrificial template) leaving behind the elastomeric foams. 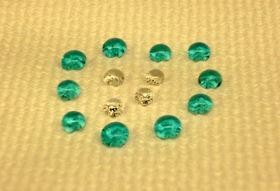 During the formation of calcium alginate microbeads, metallic precursors also get trapped in them. These precursors are subsequently released into the elastomeric matrix during its cross-linking, resulting in the controlled localized formation of nanoparticles onto the surface of the pores of the polymer foam. Such foams can be used in localized reactions for environmental applications (specific pollutants entrapment) but also in biological applications (scaffolds and artificial implants). Finally, the most recent activity of the group in this field deals with the detection and removal of heavy metal ions from water (i.e. Pb, Hg). For this reason the pores’ and the outer foams’ surface are decorated with functional nanoparticles, able to interact with heavy metal ions present in water, by cation exchange mechanisms between the nanocomposite foams and the polluted water or by ion entrapment. 1. I.S. Bayer, D. Fragouli, A. Attanasio, et al., Water-repellent cellulose fiber networks with multifunctional properties. ACS Applied Materials & Interfaces, 2011, 3(10), 4024-4031. DOI: 10.1021/am200891f (http://pubs.acs.org/doi/abs/10.1021/am200891f). 2. D. Fragouli, I.S. Bayer, R. Di Corato, et al., Superparamagnetic cellulose fiber networks via nanocomposite functionalization. Journal of Materials Chemistry, 2012, 22(4), 1662-1666. DOI:10.1039/C1JM14755B (http://pubs.rsc.org/en/Content/ArticleLanding/2012/JM/c1jm14755b#!divAbstract). 3. F. Ayadi, I.S. Bayer, D. Fragouli, et al., Mechanical reinforcement and water repellency induced to cellulose sheets by a polymer treatment. Cellulose, 2013, 20(3), 1501-1509. DOI 10.1007/s10570-013-9900-z (http://rd.springer.com/article/10.1007/s10570-013-9900-z#). 6. P. Calcagnile, D. Fragouli, I. S. Bayer, et al., Magnetically Driven Floating Foams for the Removal of Oil Contaminants from Water, ACS Nano 2012, 6(6), 5413–5419. New strategies could translate exceptional attributes of nanoscale fibers like carbon nanotubes and cellulose nanofibrils into macroscale materials.